We provide English to Arabic translation by certified Arabic translators with years of experience. Our translation is done with utmost professionalism and accuracy that not translates the source but conveys the true meaning of the content. Our Arabic translators have native-language proficiency and well-versed in subject matters relating to specific industries such as Marketing, I.T, Legal, Tourism & Travel and more. Our translators are based both in Malaysia and in Singapore. VEQTA Translations is a language service provider in Malaysia that can provide localization and translation into most commercial languages. We have subject matter experts available for perfect Arabic translation for most major industries. We adhere to localization best practices such as styleguides, glossaries, CAT Tools and full quality assurance processes. Our clients from Selangor, Johor, Sabah, Penang and Singapore rely on us for a high quality and accurate Arabic translation of all types of documents and content. 1. Arabic Main Translation Phase Our native Arabic translators will be assigned on the project according to their experience with similar content. We only use experienced native translators who have been thoroughly vetted by language testing proficiency tests. 2. Arabic Editing Once the translation has passed certain quality criteria, it’s passed to the Editor. The Arabic Editor is a senior translator who will go through and polish the text, e.g correcting syntax, grammar and flow. 3. Arabic Proof checkingAs a final quality assurance step, we will go through the Arabic documents again to give it an overall quality check, check on typos, any missing content and correct any inconsistencies in the translation. 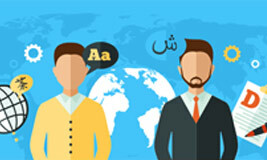 We can provide Arabic translation integrated into your marketing material, online platform, website, portal or system. Arabic language translation requires Subject Matter Expertise for a perfect result. We provide Arabic terminology experts who has worked in a related field of the source material in Arabic. Voice over in Arabic language and an array accents and other languages for cold or hot recording for broadcasting, e-learning modules or voice or video translation for corporate use. Arabic is an important language to consider for translation of your marketing material. A high quality translation will give you the maximum impact of your marketing material! A dedicated team of Arabic translators who combines Experience, Specialized Subject Matter Expertise with Translation Practices to deliver quality second to none. Arabic language is considered one of the major languages in the world. Our translation office provides professional Arabic to English translation in Malaysia It is the fifth most spoken language in the world with about 350 million people in the world considering it a native language. Many consider it a second language as well. Furthermore, it is spoken in many countries spanning many continents and regions. These range from all the countries in the Arab league as well as ones in the surrounding area, albeit perhaps only by minority populations in the latter group. It is also spoken in parts of Asia, Africa, Europe, and North and South America, where there are large populations of Arab speakers, especially due to the spread of religion. It acts as a lingua franca in the Arab world as well as the liturgical language of Islam. Our skillful Arabic translation is created from our base in Kula Lumpur as well as by our teams in Egypt and Dubai. We have years of experience of translating English to Arabic translation and providing Arabic to English translation. Historically, older forms of Arabic have influenced many other languages around the world, especially in terms of vocabulary. Many words that are used daily in European languages stem from Arabic. In English, words like alcohol, algebra, candy, coffee, cotton, lemon, magazine, sofa, and many, many more find roots in the Arabic language. In addition, the numeral system that is globally used around the world is the Western Arabic numeral system. Our translators have access to all English-Arabic dictionaries pertaining to relevant industries. For particularly large projects or complex desktop publishing in Arabic has teamed up with an Arabic Translation Company with a regional presence in Egypt and Syria. Many features of Arabic make it quite different than other major languages of the world. First, the script is written from right to left, unlike the majority of other languages in the world. This means non-Arabic readers should never attempt to copy and paste Arabic text because things can go very wrong due to it’s text flow. Arabic language is considered highly disglossic. This means that the everyday colloquial Arabic that is spoken around the world is quite different than formal written versions, as written Arabic tends to be based on the language found in the Qu’ran. However, such disglossia may be changing with technology and social media, as people use these tools to communicate with each other through text. An interesting characteristic of Arabic is the difference between colloquial versions and Modern Standard Arabic (MSA). MSA, taught to L2 speakers who have an interest in learning the language, is not a dialect that is actually spoken or based on a particular region of a modern Arabic speaking country. Rather, it relies on Classical Arabic. On the other hand, native speakers of Arabic speak Modern Standard Arabic using their regional influences, which may shape the way they pronounce words, the tone they place in sentences, and more. This differs from other languages where a standard may be based on a particular region of a country due to historical sociopolitical factors. Thus, there is a vast difference between MSA and spoken regional dialects. Moreover, regional dialects can be quite different characteristically, and in some cases, they vary to the extent that they become mutually unintelligible. Our Arabic translation agency in Malaysia works with both local Arabic translators and in-country linguists providing a thorough and complete Arabic translation service. The Arabic script is considered an abjad. In this category of writing systems, there are almost no symbols or ‘letters’ that represent vowel sounds. Rather these are inferred from contexts. Pure abjads have no vowel markings at all, but the modern Arabic script has a few, which has led some linguists to categorize it as an ‘impure abjad.’ This is comparable to the Hebrew script. The Arabic script consists of 28 letters and is written from right to left, and from top-to-bottom. The Arabic script is also used to represent other languages as well, ranging from Kurdish to Persian and even varieties of Urdu, a language of India. The history of Arabic language is a unique one as a language so heavily influenced by its religious contexts. In terms of a language family, it is considered a Semitic language. The Arabic that we hear nowadays stems from Old Arabic, which has its roots in a variety of Semitic languages found in Arabia. These spoken varieties include Safaitic and Hismaic as well as Old Hejazi. These were varieties that were spoken during the pre-Islamic period, and they were largely spoken languages, as opposed to ones that were also written. However, these first languages, along with the influence if Islam, gave birth to Classical Arabic. Classical Arabic was a formal variety used as the liturgical language of Islam and its influence on modern varieties of Arabic is still very pronounced, especially in formal writing and in the formation of Modern Standard Arabic (MSA). During its time, Classical Arabic was used as a common language of communication throughout the Middle East. After Classical Arabic, we can see a split in the evolution of language. One aspect of this split has to do with the development of Neo-Arabic, which manifests itself in the regional varieties that have branched off from Classical Arabic. Neo-Arabic can be said to include the Maltese language, but also the different varieties of colloquial Arabic that are spoken today ranging from the Western Arabic spoken in Algeria, Maghreb, Morocco and other northern African countries, as well to extending to the Eastern Arabic varieties that are spoken in countries ranging from Egypt, Saudi Arabia, Lebanon, the United Arab Emirates, and Iraq. While there may be a Western and Eastern classification, it is important to note that the varieties among the countries can vary vastly as well. The other aspect of this split is the development of a Modern Standard Arabic (MSA), which rather than being based on a certain regional variety that has gained some sort of social or political prestige, stems from the Classical Arabic that can be found in the Qu’ran. MSA is considered the literary standard across the majority of Arabic speaking countries and is one of the official languages of the United Nations. However, it is quite different from the colloquial varieties of Arabic that is a result of the Neo-Arabic evolution described above. Such a situation is an example of the diglossia of the Arabic language. At the same time, MSA is a pluricentric language, meaning that how it is read and used can shift depending from which country a speaker stems from. This can be somewhat comparable to English, where there is American English, British English, and other varieties, but where there is common ground and socially accepted conventions of correct English usage. Arabic has been influential in respects to many global phenomena. As mentioned above, it has had a large influence on the languages around the world. Second, as a vehicle to deliver religious teachings and traditions, it has influenced the cultures and groups of people that have had contact with or adapted Islam. Arabic also has a strong literary tradition stemming from Islamic, and in terms of modern literature as well, including in poems and prose. There is also a modern pop music culture, including Arabic genres such as Rai, and it is a language that is present in many forms of media internationally.